Deep in the Pyrenees mountains, this landlocked microstate is surrounded by Spain and France. Unless you really like skiing or shopping, Andorra may not be worth a stop in and of itself, but we like going places that are a bit harder to get to, and we like to see as many places as possible, so Andorra fit the bill, plus it was an easy add-on from Barcelona (about a 3 hr drive). Whatever you do, when first entering Andorra stop at the border control and go into the police station to get your free passport stamp! The police officer we spoke to was very friendly and wasn’t at all annoyed with our request (as some can be from time to time). We spent most of the day exploring the capital city, Andorra La Vella. We expected a white, winter wonderland, but to our surprise, it was sunny and so nice. Our first stop: tourism office. They equipped us with maps and tips about what to see in their capital city. One of our highlights was touring La Casa De La Vall. Dating back to the 16th century, it was built as a manor house for a wealthy family. In 1702 it became the parliament house and held that purpose until 2011 - with little crime, it even served as the national jail almost up until that time as well. The interesting tour taught us about Andorra's flag, history and culture. It’s worth a stop in our opinion. Afterwards we decided to soak up the sun and walk along the Passeig del Rec del Solà. Although there is a bit of a climb to get up the path, once there, the terrain is level and it’s an easy walk with views overlooking Andorra La Vella below. Next we went in search of the snow we’d expected to see. Afterall, it was just a few days before Christmas! We headed from Andorra La Vella up to El Serrat, stopping in small towns along the way like La Massana and Ordino. Once in El Serrat we drove to the end of the road (literally) and enjoyed a nice, quiet, wintery walk in the Parc Natural de la Vall de Sorteny. That evening we visited the Andorra De La Vella Christmas Village - and to be honest, it was probably the worst christmas market we’ve ever been to. One of the reasons we love european christmas markets is for the food, but it was pretty small and featured more handmade crafts than delicious eats. 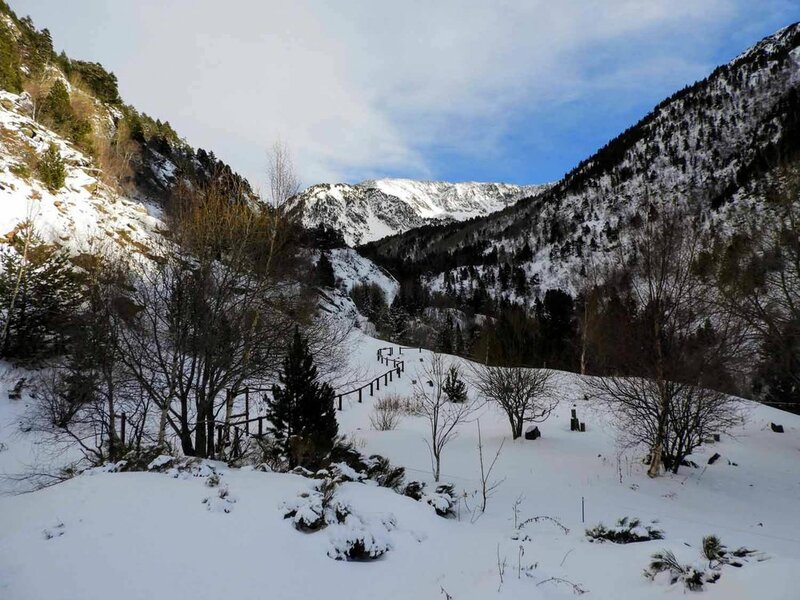 We recommend spending one day in Andorra, with at least one overnight in the city or nearby as it is likely a few hours away from your other destinations. Some rental car companies will charge you a fee for crossing into Andorra. This is bogus, but unfortunately, it is fairly common. Your rental car desk agent will try to get you to upgrade to a hefty four-wheel or all-wheel drive car. Had conditions been snowy, this might have been necessary, but given the weather when we went, we did just fine with our tiny two-door car. We flew into Barcelona, rented a car and headed North, staying in La Seu d'Urgell, about 20 minutes from the Andorran border, at Casa Catharina. We definitely recommend this place. The host was kind, easy to communicate with, and a good breakfast is included. We paid to park in lot P9A (adjacent to Parc Central) in Andorra La Vella. It’s unlikely to find free parking, so don't waste your time searching. We stayed in the hotel Font del Marge. While it was affordable, (34 euro / 42 usd), we aren’t as apt to recommend it.The front door is difficult to locate, and once we did, there no one at the reception desk. There was no bell to ring for service, so we had to call the front desk (who doesn’t love roaming fees?) The parking garage is very difficult to navigate (extremely tight corridors and turning radius) - only fitting for the most compact car possible (which we had and still managed to graze the side wall). It’s also incredibly dark and doesn’t provide adequate signage to guide you back to the hotel. Our room was fine, but we requested a quiet room and although there only seemed to be one other guest in the whole hotel, they were in the room next door with a dog. Overall, this place was okay, but it wasn’t a win by any means. Despite being outside of the EU, the official currency is the euro. Andorra is under symbolic rule of The Bishop of Urgell (Spain) and the President of France - the only country in the world where two foreign leaders share the head of state responsibilities. It’s almost as if France and Spain had a baby.